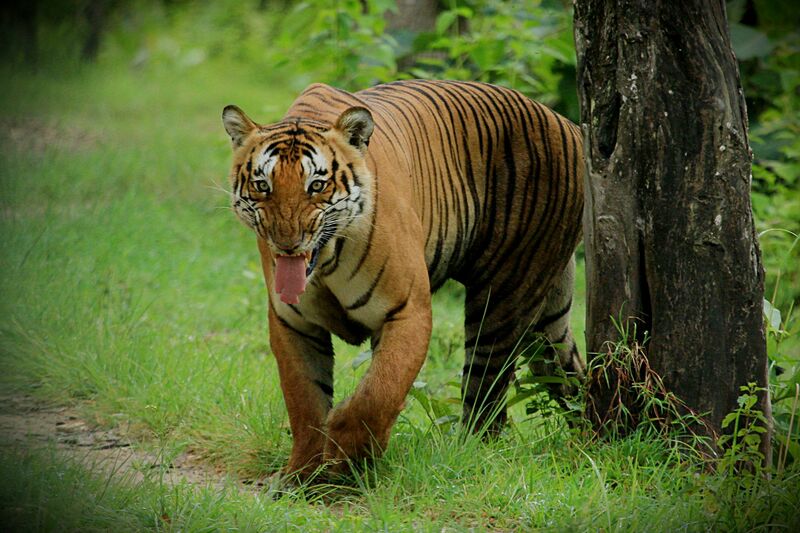 Home » Destinations » India » Karnataka » How Prince became India’s most photographed tiger! As I was growing up, my friends’ parents would tell me a lot of stories about the forest and especially the ones in South India such as Bandipur, Masinagudi, Mudumalai etc. So when I finally moved to Bangalore, I decided to visit and explore these places which had always fascinated me. I decided to start with Bandipur forest a beautiful wildlife sanctuary located in South India which offers a lot of tiger sightings when compared to other wildlife sanctuaries in the South. This forest is rich in flora and fauna including different wild-life such as leopards, sloth bears, wild dogs, elephants, gaurs, barking deer etc. It was in September 2009 when I first visited this place and decided to take the evening safari – little did I know that I was going in for a big surprise!! “ITS A TIGER” – He whispered! Late Prince was one of the most majestic tigers who ruled the Bandipur forest until 2017 like no other tiger ever had. This guy was massive. He was strong, muscular, powerful, handsome, mighty and dominant. He was first spotted by a group of wildlife photographers in 2007 when he was just a few years old. It was believed that Prince originally belonged to the Mudumalai forest range, as he was spotted numerous times by the camera traps fitted in Mudumalai forest, capturing him crossing the forest and entering the Bandipur range. He had also been very popular amongst the foresters and the visitors. Prince would often be seen gallivanting around the main streets of Bandipur forest. He was never scared of human beings and their presence. In fact, he would often come close to the safari vehicles and pose for the shutterbugs for a long time, due to which it became very easy for tourists to shoot his pictures. He was believed to be the most photographed tiger in India till date, and many people would call him the “Celebrity Tiger”. Many times, he was also seen entering the nearby villages especially a village called Mallapura in Karnataka, to hunt for cattle, but never did he harm any human being nor scared them. A few years back, while Prince was strolling through the main roads of Bandipur, he met with an accident as the driver of a private vehicle lost his balance on sighting Prince and hit him directly. An injured Prince struggled a lot. His fans thought he would not make it but Prince was a fighter and he soon made it back to normal life. The brutal accident left a deep cut on his tongue which ultimately became his identity. People could easily recognize him because of the cut. Another factor that differentiated Prince easily from the rest of the Tigers were his arms, which were huge and muscular. Handsome Prince was also believed to have had a lot of girlfriends in the forest and almost all the cubs in the forest were his, however, no one has ever been able to prove this. On 4th April 2017, the 12 year old legendary Prince and the darling of every tourist was found dead. Although the exact cause of his death is still not known but people suspect that he died due to old age. Prince’s death has come as a shock to his fans. Bandipur forest has lost one of its biggest charms and this has been a disturbing news for all his fans. Some forest officers have even decided to build a small memorial in his name. A shrine. Although Prince is not with us anymore, we are sure that wherever he is, he is giving everyone a RUN FOR THEIR LIVES!! A good read indeed and what pictures these are!! Well done guys….Way to go.. Awesome pictures & stocking story . A majestic animal yet so vulnerable. Animal lovers must surely be mourning his demise . But he has left a legacy behind. RIP Prince . He will continue to live through his pictures. Thanks to Juz . Thanx to Travelmynation, too. Correction. not stocking story but soul stirring story.